Storage beds are very popular today for many adults since there are so many styles, sizes, storage configurations and finishes. While in the past, storage beds were chosen for children's or youth's bedrooms, storage beds are quite popular now for adults. These beds offer not only upscale style but also maximum storage space for those who need extra drawers to store personal items. Many consumers select these units because they have limited space in a bedroom to place a dresser, chest or other pieces of furniture. 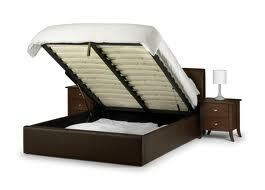 However, many beds can be found that come with matching pieces for larger rooms. It really depends on what you really prefer, but these types of units are no longer only purchased for the additional drawers. They are also selected for their superior quality and style. Here are the various types of storage beds that you can choose from if you are interested in choosing this type of sleep unit for your bedroom. 1. Captain's Bed - The most noted type of frame for storing items underneath is the captain's bed. This design has been around the longest and was originally developed during the wooden ship era centuries ago. A captain's cabin was so small on wooden ships that it was impossible to place even a dresser inside for him to store personal items. So, the captain's bed was designed to house drawers underneath the sleep space. This provided maximum usage of the floor space in the captain's cabin. Today, the captain's bed is still popular, however, it has evolved into various other looks and sizes that are desired by adult and youth alike. 2. Platform Bed - A platform storage bed is usually made with a more contemporary flair for those who like sleek, clean lines to match their existing home decor. While not all platform beds offer drawers underneath, some platform beds are made with various configurations for storage that include drawers on all sides as well as the footboard. 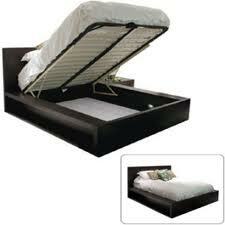 Some also include a headboard with 2 extra drawers. You can conceivably get as many as 16 drawers if you want the maximum in storage options. 3. Drawers Underneath Traditional Frame - If you simply want to add some drawers underneath your existing bed frame, that is also possible. You can turn your bed into a storage bed of sorts by sliding drawers under your bed frame that are specifically built for underbed use. Many of these drawers are made in solid wood, are visually pleasing and offer lots of space to store things. You can also purchase metal bed frames that are actually designed to house underbed drawers that you can purchase separately. 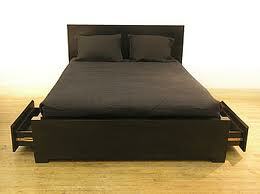 This set up is much less expensive than purchasing an entire storage bed set. If you are interested in choosing one of the many bed that are made to store items, there are many to choose from that are high end, quality products. You can also find moderately priced units that will fit your budget. Before you make your selection among the various types of storage beds, be sure to compare prices, drawer configurations and quality to ensure your complete satisfaction.